The Panamint City town site sits high in Surprise Canyon in the remote and desolate Panamint Range of Death Valley in southern California. The area was occupied by outlaws in the early 1870's as the location was remote enough to serve as a refuge from the law. It was one of these outlaws that stumbled upon the first silver outcrops in 1872. By 1873 a ragtag group of prospectors and outlaws were living in caves and other primitive shelters while small scale mining the canyon's surface deposits. Late in 1873, bags of silver ore were transported to Los Angeles in a bid to attract investors to the newly formed Panamint mining district. Nevada Senator John P. Jones heard of the Panamint excitement and decided to use some of his recently acquired Comstock wealth to purchase Panamint claims. Jones, along with Senator William Stewart, were reported to have paid $350,000 for several of the claims, and were able to line up investors to the tune of $2 million dollars. This rush to invest in a remote and unproven district illustrates how the great fortunes that were being made on The Comstock Lode clouded the judgement of would-be investors in other districts. When news got out about the investments being made in the remote district, a rush started for the Panamint mountains. By early 1874, a crude and lawless settlement had formed that stretched almost a mile through the upper part of Surprise Canyon. Panamint is fifty miles east of the summit of the Sierra Nevada, two hundred miles from Wilmington, the nearest sea port, and four thousand feet above the sea, in the midst of a desert, with a very hot Summer climate, and little wood or water in the vicinity. The expense of living must be great there, and the mines must be rich to pay people for living in the midst of such desolation. Panamint City reached the height of the frenzy in the latter part of 1874, with as many as 2,000 miners, merchants, prostitutes, outlaws, and other assorted characters calling the camp home. "A gentleman just in from Panamint reports the district in a fever of excitement. The mines are developed sufficiently to warrant the belief that they will rival in richness the famous Virginia City mines. He says the camp now contains 700 miners, and more are arriving every day - some by the Bakersfield route, but most come by San Buenaventura, as it is the cheapest and quickest. Meals can be procured in Panamint for 75 cents and $2 for animals." "The town is filled with saloons, and gamblers are doing a splendid business. He says he saw $2,000 in one pot. A pretty good indication of good times - so old Californians say. Building lots command a high figure - $500 to $1,000, and considerable numbers are changing hands at that figure. New buildings are going up rapidly. The lead owned by Stewart, Jones & Company is said to surpass, in richness and vastness, anything ever before struck west of the Rocky Mountains." At it's peak, Panamint City had at least ten saloons, a brewery, a lumber yard, a bank, a hotel and a red light district. By 1875, the town had over fifty wooden homes. April 12, 1875 - Arriving passengers from Panamint report that Chavez with about twenty Mexicans, are operating on the road between Panamint and Cerro Gordo. They have laid up and robbed two men on the road within a day or two. Fifty men from Cerro Gordo are out hunting the robbers. There is great excitement at Cerro Gordo and Panamint and guards are kept out at both places. April 23, 1876 - Information just received from Panamint: On April 20th, McDonald and Small, notorious stage and express robbers, an hour ago entered the store of Harris & Kline, drew their pistols on the clerk, and robbed the safe of $1,000 in gold coin and checks to the amount of another thousand. 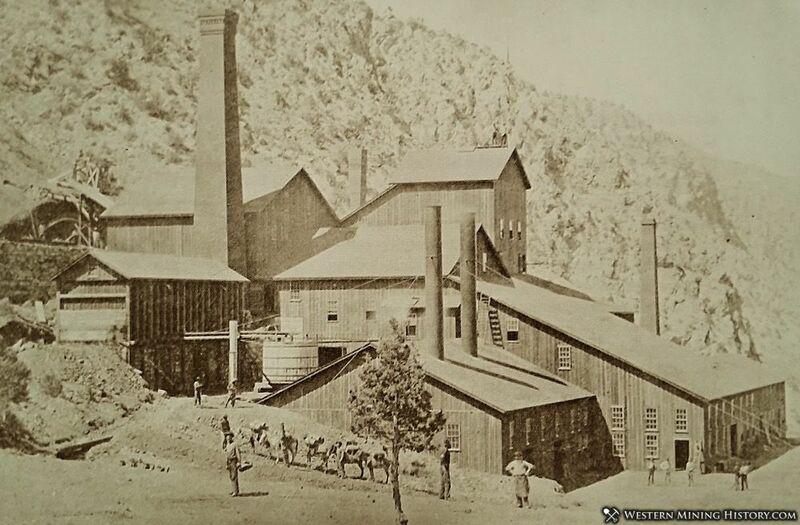 In June of 1875, Jones and Stewart's twenty-stamp mill began operations. Unfortunately the ore bodies proved to be less extensive than originally estimated, and just months after the impressive mill was put into service the mining industry in the Panamint district was in decline. 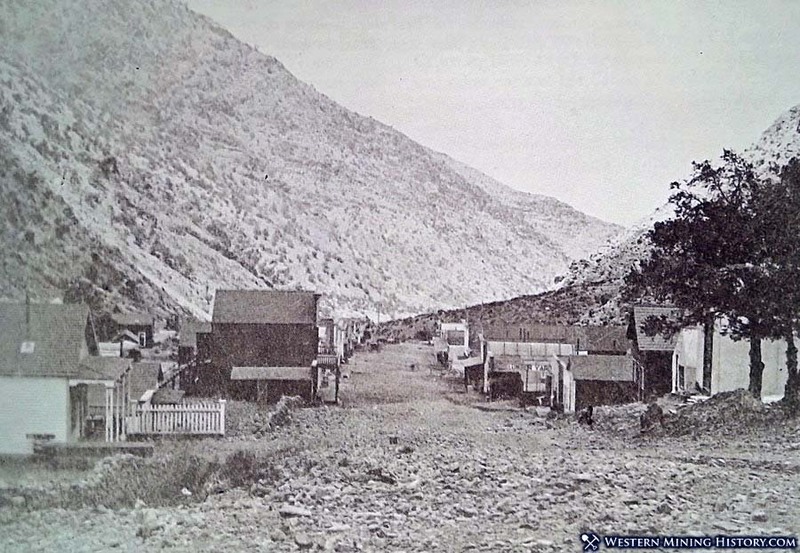 Most of Panamint City's residents had moved on to other mining towns by 1876. In July of that year, a flash flood roared down Surprise Canyon and wiped out most of the town. It would seem Surprise Canyon was ironically named. Today Panamint City is within the boundary of Death Valley National Park and is only accessible by a strenuous 15 mile round trip hike. The only remains are the smokestack and foundation of the mill and a few random buildings.